Why It's So Hard To Turn The Lights Back On In Puerto Rico Almost a month after Hurricane Maria made landfall, most of the island is still without electricity. Officials have estimated it could be months before power is restored. A worker repairs power lines in San Isidro, Puerto Rico. An outdated, aboveground power grid coupled with a comparative shortage of utility workers have hobbled efforts to restore power in the territory. Nearly a month after Hurricane Maria swept through Puerto Rico, almost 80 percent of the territory is still without power. While nobody expected a quick restoration of Puerto Rico's badly outdated power grid, officials have estimated that it could take at least six months. Puerto Rico's slow restoration is in stark contrast to Florida after Hurricane Irma hit. Within 24 hours, 20 percent of the power that had been knocked out by Hurricane Irma in Florida had been restored. Nearly half had been restored a day later, and it only took a week before more than 95 percent of Floridians had their lights back on. Puerto Rico was hit by Hurricane Irma, too. It wasn't a direct hit, but two-thirds of the territory lost power. And like Florida, more than 95 percent of Puerto Ricans had power a week later. But unlike Florida, Puerto Rico was hit again shortly thereafter. And unlike Hurricane Irma, Hurricane Maria swept directly through Puerto Rico, this time knocking out power across the entire territory. An outdated, aboveground power grid coupled with a comparative shortage of utility workers have hobbled efforts to restore power. Puerto Rico's power grid — like much of its public infrastructure — has lagged behind rest of the country. This point was exposed by Hurricane Irma, but the problem has existed for decades. Puerto Rico's debt crisis has prevented much-needed improvements to power plants that are more than a half-century old. The Puerto Rico Electric Power Authority, which is owned by the government, has faced crippling debt and Puerto Ricans have been footing the bill. According to the U.S. Energy Information Administration, electricity cost around 19.88 cents per kilowatt hour in Puerto Rico this year. That is well more than the national average of 13.22 cents, despite frequent service interruptions. In July, PREPA filed for bankruptcy, just months after Puerto Rico as a whole did the same. Three months later, the territory now must figure out how to pay an estimated bill of $5 billion to restore its power grid. 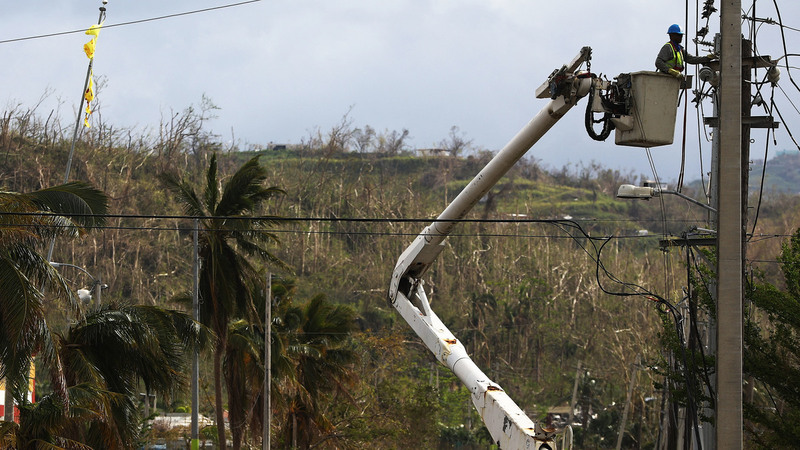 In addition to being outdated, much of Puerto Rico's electrical infrastructure is aboveground and exposed to the elements. Strong winds and tree branches damaged power lines, transmission towers and substations that were already weakened by Hurricane Irma less than two weeks before. 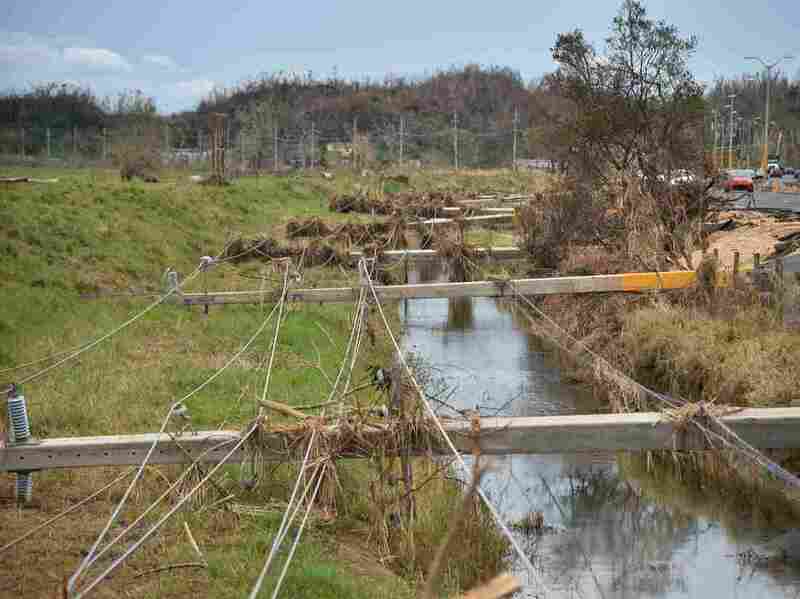 Hurricane Maria destroyed power lines across Puerto Rico, including these in Vega Alta. The result was a complete blackout — and a much tougher and costlier job for PREPA. Maria left dangerous conditions that prevented recovery efforts from beginning in earnest for almost a week. The storm also decimated communications and transportation infrastructure, causing further difficulties in coordinating response efforts. Almost a month later, problems still plague the recovery effort in Puerto Rico. PREPA's financial crises meant it was slow to begin its response to the storm, even considering the hazardous conditions left in Maria's wake. It took more than a week for just 5 percent of power to be restored in Puerto Rico and almost another week before any significant progress was made after that. Transmission line faults have occasionally wiped out progress. On Oct. 13, for example, a fault caused the San Juan Power Plant to go offline, dropping the amount of power restored in Puerto Rico from 17 percent to 9 percent. It wasn't until four days later that the percentage of power restored was back over 17 percent. The number of people working to restore power in Puerto Rico is underwhelming compared with the response in Florida. After Irma, hundreds of public and private electric companies helped Florida and surrounding states recover. The Department of Energy estimated more than 60,000 workers were deployed. The number of companies helping out in Puerto Rico after Maria is also comparatively small. PREPA's inability to help cover the cost of their assistance means fewer companies are sending crews to the territory. The U.S. Army Corps of Engineers has taken the lead on the project instead. The Corps said Wednesday that there were about 400 crews of three to five people working to restore power in Puerto Rico, including PREPA employees and a handful of public and private companies. Another 200 crews are expected to arrive next week. Back in 1989, Hurricane Hugo left Puerto Rico without power for six months. It was slightly weaker when it made landfall — a Category 3 to Maria's 4 — but still one of the worst storms in Puerto Rico's history. Now, almost 30 years later, there may be only minimal improvements in the time it will take to restore electricity to the territory. Meanwhile, Hurricane Irma caused damage to Florida similar to Hurricane Wilma in 2005, 12 years earlier. The Department of Energy said this time around, Florida Power & Light restored power four times faster.